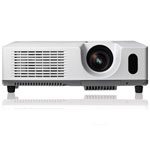 Lightweight and portable, the eco-friendly NEC NP4120 is a 2600 lumen projector that provides VGA networking to your PC and MacBook. Great for small to medium audiences. The popular Dell 1510x has a 3500 lumen display, with bold, crisp images, even in lit environments. HDMI, VGA, and dual-video ports offer connectivity to almost any device. 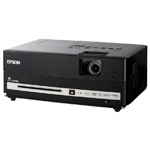 Enjoy an all in one home theater experience with the high definition Epson Movie Mate, complete with built in DVD player, Dolby Digital stereo sound, and HDMI networking. 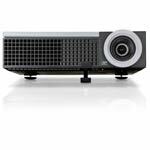 An excellent projector for creating large images in small spaces, the DLP Optoma features a multitude of connectivity ports and maintains a clear image in office or natural lighting. 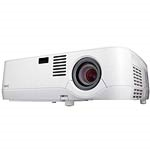 Weighing in at 3200 lumens, the Hitachi CP-X3011 is an excellent LCD projector for classroom and boardroom presentations, with a template function and active iris feature. 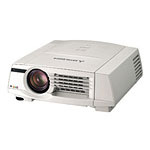 Suited for larger audiences, the bright 5000 lumen Hitachi CP-x5021n is an LCD projector that offers easy USB plug and play accessibility for presentations, slideshows, and video. 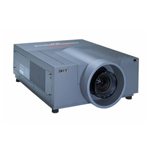 The super bright Eiki is a powerful, yet portable projector providing a vast 12,000 lumen display perfect for large auditoriums, exhibition halls, and main stage events. 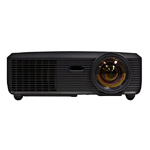 Not sure which projector is right for your event? Need a quote for accessories? Our knowledgeable team of experts are happy to make recommendations and answer any questions you might have. From small to big events, professional meetings to social gatherings, Projector Rentals is here to help make your event a success. Contact us today through our quick quote form, call us at (888) 951-5060, or send us an email to learn more about our service.